The dam wall at Ka Loko Reservoir collapsed, killing seven people. The families of six of the victims have filed a lawsuit. The families of six of seven people killed in the Ka Loko Dam breach in March filed suit yesterday, alleging that landowner Jimmy Pflueger did work on the dam and covered up a spillway, or escape route for excess water. 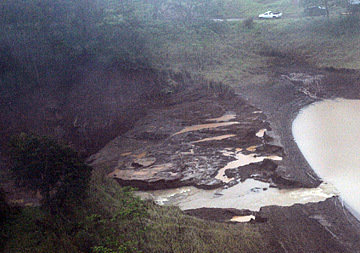 The lawsuit alleges that Pflueger illegally altered the Ka Loko Reservoir and spillway. After the March 14 breach, Pflueger and his fellow defendants altered, destroyed or removed evidence that could be relevant to this lawsuit, the suit said. But Pflueger's attorney Bill McCorriston said there is no relation between the breach of the dam and the spillway in question. "We encourage everyone to hold judgment until all the evidence is gathered and the investigations are complete," he said. Lawyers filed the suit in Kauai Circuit Court yesterday on behalf of Aurora Fehring, husband Alan Dingwall and their son Rowan Fehring-Dingwall; Daniel J. Arroyo and his fiancee, Christina McNees; and Wayne Rotstein. The family of victim Timothy Noonan did not join in the suit. The bodies of McNees, Fehring and Dingwall were the only ones recovered. Fehring was the daughter of Bruce Fehring, a Kauai farmer and real estate broker who owned the property where the victims who perished were staying. McCorriston called the filing of the suit unfortunate since the state attorney general is still investigating the matter. Pflueger, who is conducting his own investigation, has cooperated with state authorities, McCorriston said in a statement. They have already learned that the state knew about hazards at Ka Loko Dam as early as 1982 but did not share it with the public or Pflueger, who purchased the property in 1987, he said. Evidence uncovered thus far indicates Pflueger graded the property without permits, lowered a hill and used the dirt to cover the spillway, and increased the height of the reservoir, said plaintiff attorney Rick Fried. Pflueger altered the reservoir so that private recreational watercraft could be operated, Fried said. In 1998 a neighbor had expressed his concerns to Pflueger about his actions. "We were worried about it and told him you can't close off the spillway," Fried quoted the neighbor as saying. The state made every effort to contact Pflueger and the trust at least since 1999 to obtain permission to gain access to the property to examine the reservoir but was repeatedly ignored, Fried said. At a deposition in January this year, Pflueger indicated that he was aware there was seepage at Ka Loko Dam. This is especially critical because water seepage can undermine the integrity of the dam, Fried said. Also, in the weeks before March 14, Pflueger or the trust were questioned about the integrity of the dam after a resident witnessed a wave of muddy water from Pflueger's property damage a bridge. The suit also alleged that Pflueger and the trust repeatedly denied permission or ignored requests for state inspectors to examine the dam and reservoir, the fifth largest in the state. Pflueger has since told the Star-Bulletin that he never saw a concrete spillway, as others have alleged, and that he never covered it up. Harvey Henderson, attorney for the Mary N. Lucas Trust and Taylor, said their sympathies go out to the families and friends of the victims. "The Mary Lucas Trust has been a good neighbor to the people on the North Shore of Kauai," Henderson said. "We're confident that when the facts come out, the trust will be exonerated from this tragedy." He declined to comment specifically on the suit, saying he had not yet seen it. The attorney general is expected to appoint an independent investigator from a list of five names to investigate what went wrong and who was responsible for the tragedy. The plaintiff attorneys -- Cronin Fried Sekiya Kekina & Fairbanks, Davis Levin Livingston Grande, and Kauai attorney Teresa Tico -- represent 32 other individuals who suffered property damage as a result of the flooding and are expected to file suit soon. The plaintiffs are seeking an unspecified amount of damages to be determined at trial. Among other relief sought in the complaint is permission for the plaintiffs to inspect the property. » Honolulu attorney Carroll S. Taylor is trustee of the Mary N. Lucas Trust, which owns part of the land where the Ka Loko Reservoir sits on Kauai. A Page A1 article last Friday incorrectly said he was the trust's attorney.